I have had such a nice, relaxing Sunday today. Have been camping out at my parents all weekend, but today it was time to get home and get the flat sorted for another week. After sorting the flat (not that much to do for once!) 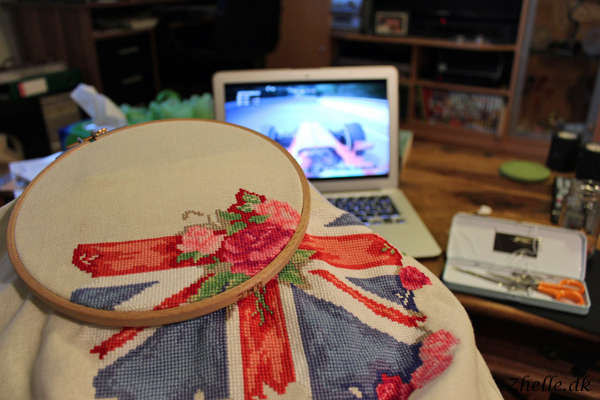 I spent the day on the sofa watching Made of Honor, Ancient Aliens and Formula 1, while working on my embroidery and drinking tea. 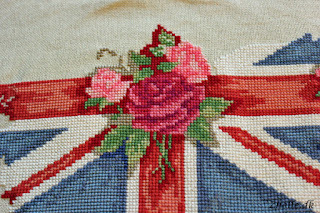 I have made quite a bit of progress on the roses in the middle since the last update (this project is starting to work up fast! At least faster than it has). The two light pink roses are now done and most of the leaves surrounding them are done too. 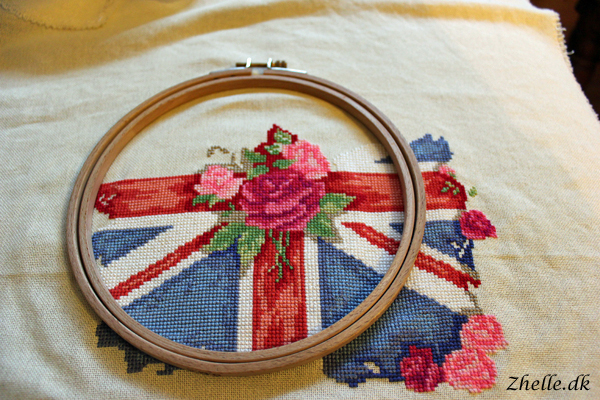 I still need to do a rose bud, and then the center flowers are done. 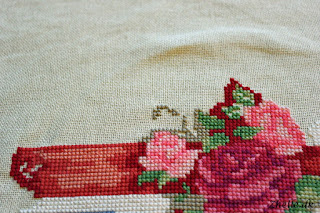 You can see where the rose bud are going to go, the beige colour that surrounds it has already been stitched. The next bit I am starting on, is the white part of the flag above the red "arm" in the picture above. 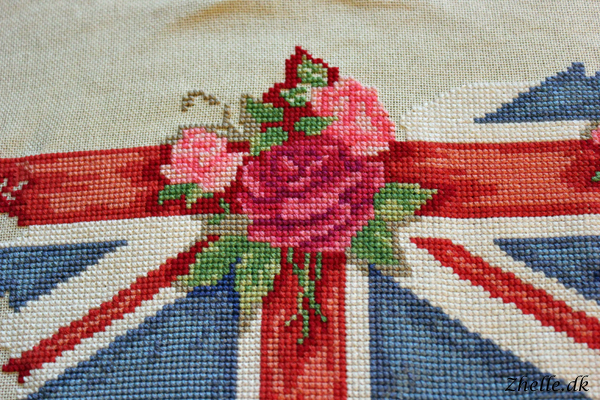 I have had enough of the fiddly roses for a bit, and I need to do some good clean stitching again! This is how the whole project looks as of now. 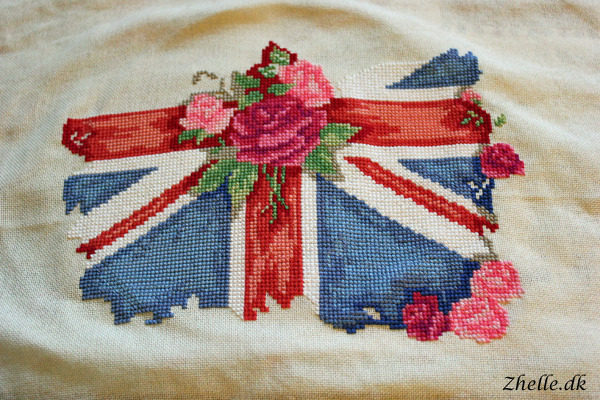 A lot of the outer edges still need to be stitched, and a lot of little roses needs to be stitched up too! 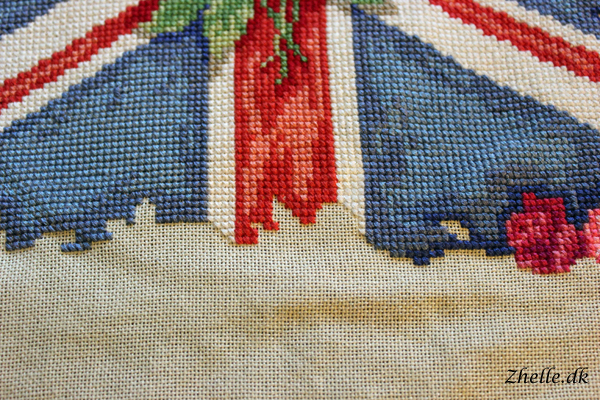 As you can see here, the darker edges just sorts of stops, and I need to get them going again. I do think that I am going to wait a bit before I do that though. At least the middle part of the embroidery needs to be done before i start that again! As you can see on a lot of the pictures I upload, I use a wooden hoop. The tension is getting harder and harder to keep the more of the flag I fill out. I recently discovered the Q Snap frame on sewandso through a user on Instagram. It should be so much easier to get the right tension to work with on it compared to a wooden hoop, so I have put it on my birthday wish list for my fiancée. Here's to hoping I might get one of them!